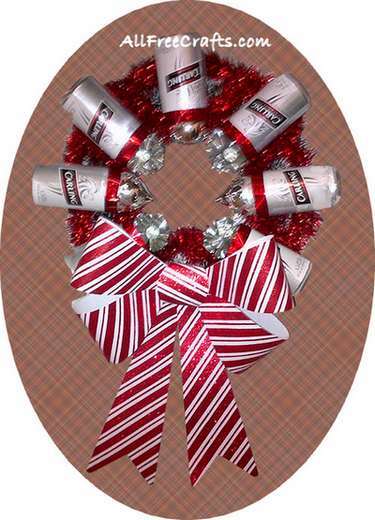 Make the Perfect Christmas Wreath for a Man Cave – with Beer Cans! My friend’s son had a Grey Cup football game party out in the garage, and the beer can empties that were left behind were plentiful. She could have returned them for a small deposit, or put them in the recycle bin – but, at this time of year, she was looking to make homemade gifts for a few special men in her life. She looked around the garage. Well. Let’s see. Beer cans. Cardboard boxes. A good start. She brought those basic supplies inside the house and got to work. A raid into some older Christmas boxes that held ornaments she hadn’t used in years and she was set. Time to warm up the glue gun and go. The first thing you need to do is establish the size of the cardboard circle that you need to make the wreath. To figure this out, take some beer cans and arrange them on a table with the tops pointing in toward an inner circle. Once you have an arrangement that works for you, measure across the diameter and use that measurement to determine the size of your cardboard circle wreath base. Cut two cardboard donuts of the same size. These will establish the size and shape of the finished beer can wreath. For tips on this, see the Fall Glitter Wreath Craft Project. Put one cardboard circle on top of the other, and secure them together by wrapping them with duct tape. This also provides a good surface for melted glue. Use a can opener, preferably one that leaves no sharp edges, to remove the top from the beer cans. Gather some Christmas balls that will fit on top of the cans. Glue them in place with a hot glue gun, positioning all the balls upside down so the usual hanging top is hidden inside the top of the beer cans. Once the bottom of the wreath is sorted out, arrange the ornament-topped beer cans all around the top, spaced an equal distance apart. Secure to the duct tape with hot glue. Take a tinsel garland and begin winding it in and out and around the beer cans, securing in between the cans with some hot glue. There’s no need to take the garland around the back of the wreath; simply wind the garland around the beer cans on the front surface of the wreath for the best effect. Done! My friend initially made two of these beer can wreaths – one for her son and one for a next-door neighbour. Both were put on display within minutes – one on the garage door and another on the door to the basement. Both leading to areas of the house where the men of the house like to tinker. The perfect homemade man-cave wreath! 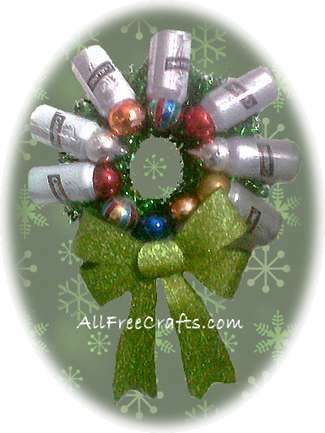 Within two days, she had custom orders to make more beer can wreaths. The customers supplied their favorite brand of empty beer cans and she sorted out the rest. These homemade wreaths are festive, earth-friendly, and both cheap and easy-to-make. Definitely worth a place on your hard-to-buy-for Christmas list for guys.